Textiles on the Edge... (of the Planet): day 15 Res. Logwood. Logwood comes from the very heart of the tree. It sounds very bad from an ecological point of view, so I just looked it up and found that there are various projects around the world which are growing and harvesting logwood in a sustainable way. Here is a link to a project in the Caribbean. The dyebath had been used previously to dye quite large pieces and today it dyed lots and lots of samples, and still seems to have life in it so a little obviously goes a long way. Most plant dyes produce yellow, or brown. 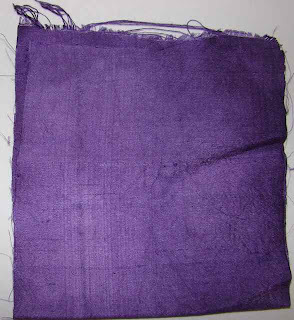 Logwood makes a gorgeous purple. It is very pretty and I can imagine how excited the first people to discover it, must have been! Logwood on thick wool blanket, thinner wool blanket, linen, cotton. 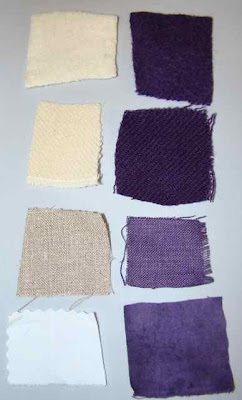 I was amazed how well it took on the linen and cotton as most plant dyes do better on protein fibres. Pretty amazing stuff but should be saved for special occasions.